Welcome to Hockey Fights T1D! A little over a year after my son Logan was diagnosed with Type 1 Diabetes I was thinking of a way to combine our love of hockey with the need to raise awareness and funds to find a cure for this life altering disease. In August of 2014 Logan and I formed an organization, Hockey Fights T1D, and started planning a benefit event that included an ice hockey game with raffles. Local hockey players made a donation to the Juvenile Diabetes Research Fund (JDRF) to play in the game and friends and family gathered in support. Items were donated from local businesses and were raffled off to raise additional funds. We at Hockey Fights T1D are proud to announce the Hockey Fights T1D Premium Jersey. 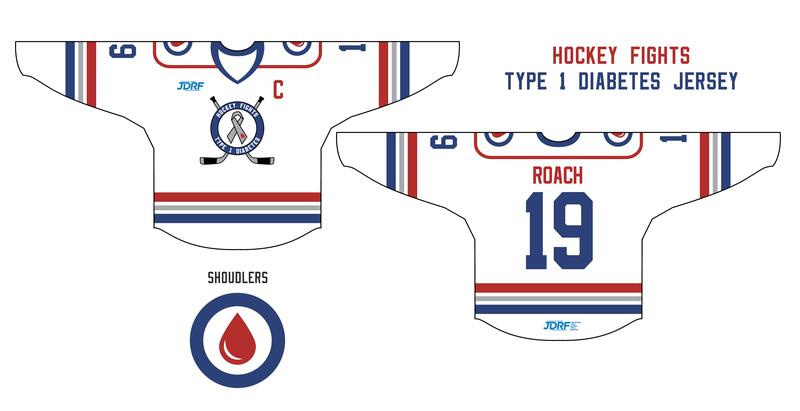 Over the past 7 months we have worked with graphic designer and Type 1 Diabetic professional hockey player Taylor Vause, on this original design. The design of the jersey displays many icons which have an important meaning in the Type 1 Diabetes community. Featured on the front of the jersey is the Hockey Fights T1D logo (originally designed by graphic designer Mike Verminski). The center features a grey ribbon, which is the color chosen to represent Type 1 Diabetes. The ribbon features a blood drop, which represent the testing of blood glucose, a key component of managing T1D. A blue circle, an international symbol in the diabetes community, surrounds the gray ribbon. “The color blue reflects the sky that unites all nations and is the color of the United Nations flag. The blue circle signifies the unity of the global diabetes community in response to the diabetes pandemic.” Two crossed sticks are the background of the circle and ribbon. The 2 hockey sticks represents our method of spreading awareness, and helping to raise money for new therapies and a cure. The shoulders feature the drop of blood again, representing the many blood tests per day that Type 1 Diabetics must perform; as well as the one drop of blood that can be used to diagnose someone and save their life. Taylor Vause is a professional hockey player that was diagnosed with Type 1 Diabetes when he was 17. He has played for the Swift Current Broncos, Texas Stars, Idaho Steelheads, Colorado Eagles, and the Adirondack Flames. He is currently playing for the Bolzano HC in Austria. Vause has designed jerseys worn by the Texas Stars, the Colorado Eagles, and 4 jerseys worn by the Swift Current Broncos. You can check out Full Stride Designs by Taylor at https://www.behance.net/fullstridedesigns. He is also well known for his NHL Photoshops (http://imgur.com/a/RqPKG). $5.00 from every jersey ordered is donated to the JDRF. Jerseys are made in the USA by Sublimation Kings. Your jersey can be personalized with a name and number or left blank. Together We Can Turn Type 1 into Type None!